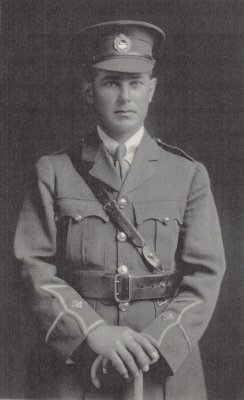 Description 1 x sepia photograph of Colonel Churchward taken in 1915 WW1, wearing the uniform of a Second-Lieutenant. Colonel Churchward did not retire in 1919, but stayed in the Territorial Army being promoted to Lieutenant-Colonel and then Colonel of the Regiment. He also served in WW2 and was awarded the Africa Star after active service in North Africa [awarded to those who were on active service between June 1940 and May 1943], and two other awards. He was also awarded the ED [Efficiency Decoration] and an OBE [Order of the British Empire]. See "Onward" by Sir Edward Latter, a history of the Nelson, Marlborough, West Coast Regiment. When William Thompson Churchward (Billy) went to war in WWI he was a solicitor in the legal firm of Conolly, Burden and Churchward, a law firm started by Edward Tennyson Conolly in Picton soon after his arrival in 1865. After the war Billy returned to the same firm, and in 1925 they moved into new premises in High Street, Blenheim, known as Temple Chambers. The firm, then known as Churchward, Burden and Reid, is still in business today as Hardy-Jones Clark, Lawyers, and they are still at Temple Chambers, 76 High Street. Billy and his wife, Lucy, were married and had a small daughter before he volunteered for the 20th Reinforcements as a non-commissioned officer in 1916. They lived at The Moorings, 80 Nelson Street, and he was a 2nd-Lieutenant in the Territorials. He was sent overseas in 1917, was wounded at the Somme, France in 1918, and went back to Sling Camp, in England to recuperate. After he came home he stayed with the Territorials, eventually being promoted to Colonel of the Regiment. Letters he and his wife exchanged during WWI are part of the Museum collections and two excerpts are shown here. Mrs. Loughnan, mentioned in one, is wife of Blenheim's Stipendiary Magistrate who was a personal friend of Billy's. In WWII Billy served in North Africa and whilst involved in active service there won the Africa Star. He also won other awards, including an Efficiency Decoration, and in 1962 was awarded the OBE (Order of the British Empire) for services as Crown Solicitor at Blenheim for many years. An undated cartoon lists his involvement in the community after his return from WWII. William Thompson Churchward, Crown Solicitor, Lieutenant-Colonel (Reserve List), Senior Partner of Burden, Churchward & Horton, Barristers & Solicitors. Member Ccl. N.Z. Law Society. Blenheim Club (Past President), Marlborough Club and Fellow Royal Empire Society. Past President Rotary Club and Progress League. President Marlborough Golf Club and Territorial Assn. Ex O.C. Nelson, Marlborough and West Coast Regiment. Recreations: Golf, Swimming, Football and Mountaineering in former days. William Thompson Churchward owned his own home, which was architecturally designed and built about 1911, and considerable land in the borough area. Kingwell Drive in Springlands, which was once part of his house property, is named for his wife, Lucy Kingwell Churchward (nee Skinner), and his will left money to the Blenheim Community for the making of a park. After his death in 1965 Churchward Park, in Maxwell Road, was created and named for him. It is the home of Riding for the Disabled.